The mission statement of First Baptist Church states that, “As a community of faith, we share the love of Christ through missions and ministry.” More specifically, we offer opportunities for worship, fellowship, missions and ministry all of which are designed to proclaim the love of Christ. It is our goal to offer a variety of programs for all ages, from preschoolers to senior adults, for spiritual growth, and hands on mission endeavors. The educational experience is geared toward fellowship and outreach. It is important that our members and guests experience a friendly, engaging, and receptive environment where they grow faithfully in their relationship with Christ. Since our beginnings in 1874, First Baptist has stood firm to the historic principles of priesthood of the believer, the authority of scripture, and freedom of the individual. First Baptist is also involved in a number of mission organizations which proclaim the liberating power of Christ through all the earth. Mission organizations supported by First Baptist are: Mt. Zion Baptist Association, and the Cooperative Baptist Fellowship. In addition to these organizations we also seek to cooperatively work with other churches and social organizations in the area to support community and world mission needs. This is a program at FBCG set-up for all ages. We will meet the 2nd Tuesday of each month in the Ministry Center. This program event is designed with YOU in mind, and is for ALL ages. It’s an opportunity for us to meet, have a short devotion, do some cool things and have a lite brunch. Tuesday, March 12th @ 10:00am we will meet in the Ministry Center for our Morning Fellowship. We will have a good time as we play Bingo together (with prizes) and have a soup lunch. Please bring an inexpensive item that can be used for Bingo prizes. If you would like to provide a pot of soup, contact Shannon. Make plans to share this good time together. If you have any questions about Tuesday Morning Fellowship, contact Shannon Hall in the church office or by email at Shannon@fbcgraham.org. All are welcome! “Tuesday @10” will meet the second Tuesday of the month at 10:00am in the Ministry Center. Please join us when you can! 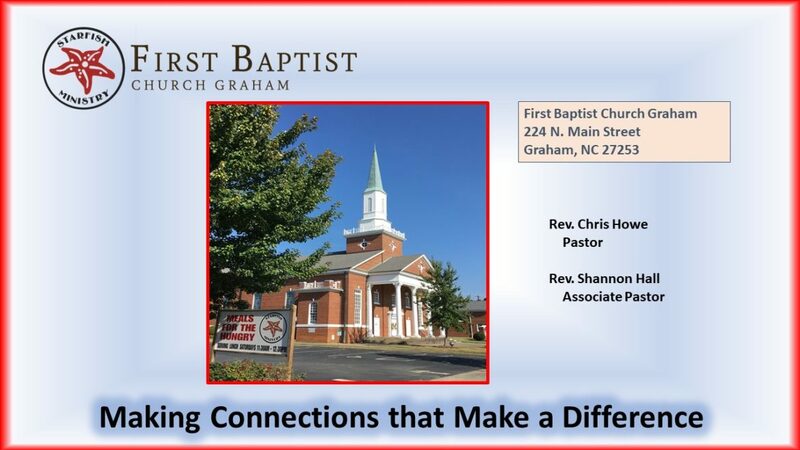 Our Children’s Ministry at FBC Graham is growing in wonderful ways. We offer many different opportunities for children to learn more about what it means to live in community and to learn about God’s love. On Sunday mornings at 9:30, our children’s Sunday School meets to learn about who God is and how God shows us his love. Our children’s teachers use many hands-on activities to engage children in learning, and the children leave each week knowing their teachers care about them. For our youngest Sunday School students (infants through age 3), we provide childcare in our nursery. During Sunday morning worship at 11:00, we provide worship bags and bulletins for all children, and we encourage families to worship together and let children see what it means to be an active participant in singing, praying, speaking and listening to God speaking in many ways. A nursery is available during worship for infants through age 4. On Sunday evenings during the school year, our Celebration Choir (children’s choir) meets at 5:00 p.m. in the choir room near sanctuary. We learn fun songs and sing in morning worship throughout the year. After a snack supper at 5:45, our children have the opportunity to learn about how we can share God’s love throughout the world. Our missions education time is called Spark, and children enjoy participating in our backpack ministry as well as hearing about missionaries around the world and across the street. They begin to understand how they can tell others about Jesus and show Jesus’ love everywhere they go. During November at Spark, children participate in Operation Christmas Child as they put together shoeboxes with small toys and toiletries to send across the world through Samaritan’s Purse. Got Kids? Bring them to our Sunday Service for our “Children’s Message”. This is a part of our morning worship service, which begins at 11:00am. Our kids and youth are an important part of our church family. During the service we also provide a nursery, staffed with our women of the church volunteers. There are also Sunday School opportunities for kids/children as well as a Children’s Celebration Choir which meets and practices each Sunday evening at 5:00pm. Have questions? Please call our church office (336) 226-7395 or come by to see our church staff during our Mon-Fri office hours. Each year, we have an Easter Egg Hunt on the Saturday before Easter, and in the fall we have a fall festival or Trunk or Treat for children in our church and community. Vacation Bible School as well as Summer’s Cool children’s events in the summer allow our children to have fun when school’s out! Sunday School for youth grades 6 through 12 meets weekly on Sunday morning at 9:30. Several of our youth are members of our Chancel Choir and sing in worship each Sunday at 11:00. Worship is a time for our church family to come together and celebrate our community in Christ as we sing together, pray together, and hear and speak God’s word together. Youth are often asked to participate in worship leadership through scripture reading and music. Our Youth attend Passport Missions Camp at Averett University in Danville, Virginia, for one week each summer. FBCG Youth participate in several different missions activities in the Danville community throughout the week and enjoy meeting other youth from around the country as they learn more about their place in the world. In the spring, we have a youth fundraiser meal following morning worship where we ask the church family to contribute toward our Passport camp tuition. When our youth return from Passport Camp, they share with our congregation in worship their experiences and what they have learned. Youth fellowship activities take place throughout the year, and youth participate in many different ministries through FBCG, especially our Starfish Ministry and Backpack Ministry. Youth also provide leadership at our community events such as FallFest, Trunk or Treat, Easter Egg Hunt, and Vacation Bible School.